The following are the meetings and events of 2017. January 10th Mr. Nate Chicon - Aircraft Inspection Services - "NDI - The Principles of Eddy Current"
February 7th CMH ATC - "Ask a Controller"
April 12th Dr Mike Stretanski AME "Basic Med Medical Changes"
May 9th Dr. Richard Wetherald - FreeFlight Systems - ""Aircraft Ownership Costs""
January 10th - "NDI - The Principles of Eddy Current"
Our January meeting was held in the Lane Aviation Media Room at their John Glenn International facility, 4387 International Gateway, on the second floor. Vice President Jeff Gruber stood in for President Joe Lippert this month who was on the road with an aircraft in inspection. Jeff reviewed the Holiday Dinner event and announced the COPAMA Board for 2017. 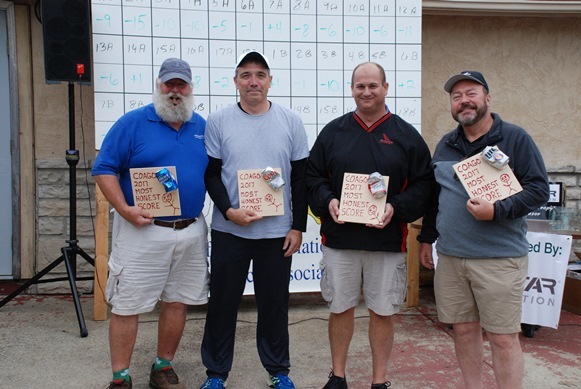 The officers stay the same with Joe Lippert - President, Jeff Gruber - Vice President, Earl Redmond - Treasurer and Lowell Dowler - Secretary. 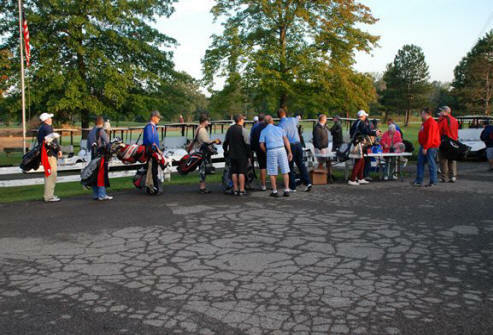 Dave Fragale, Chuck Jenkins and Gene Sprang fill out the rest of the roster. 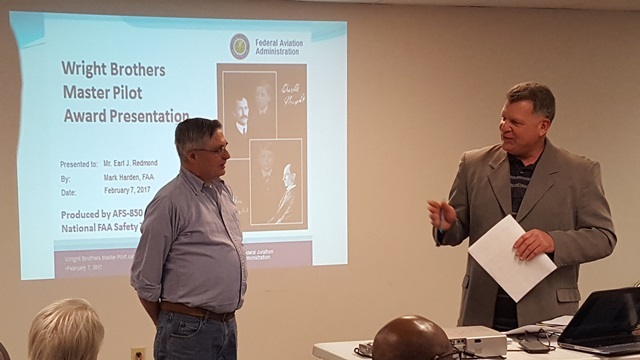 The presentation was given by Nate Chicon of Aircraft Inspection Services and those in attendance received FAASTeam AMT credit. 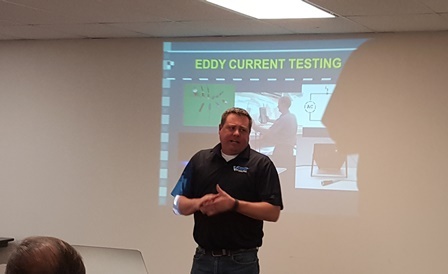 Nate's program focused on the Eddy Current technique of non-destructive testing and he started with the training and testing requirements for First, Second and Third Class NDT technicians. He gave an overview of how eddy current equipment works, detecting disturbances in magnetic field flows by defects in the material being tested. He compared it to the eddy currents created in a stream when rocks or other objects are located in the main current flow or along the shoreline. He then showed photos of some of the aircraft were problems were found and gave examples of a few known problem areas. He finished up by demonstrating his test equipment on a wheel half and some other aircraft parts. We wish to thank Nate and Aircraft Inspection Services for an enlightening topic. February 7th Meeting - CMH ATC - "Ask a Controller!" Our February meeting was held one week early to avoid any disturbance of St. Valentine's celebrations. 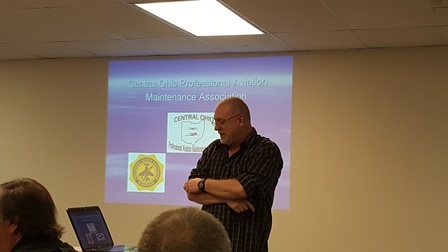 We met in the Lane Aviation Media Room at their John Glenn International facility, 4387 International Gateway, on the second floor and feature a presentation by CMH Air Traffic Control Tower on Central Ohio airspace they control. The beginning of the meeting was filled with Awards and Presentations. 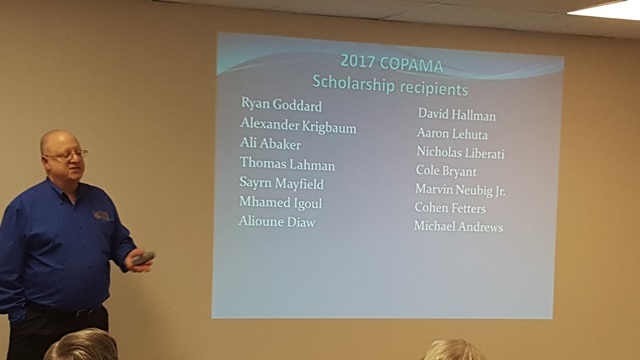 Gene Sprang conducted the evenings program starting with the announcement of the 2017 COPAMA Scholarship Award recipients. 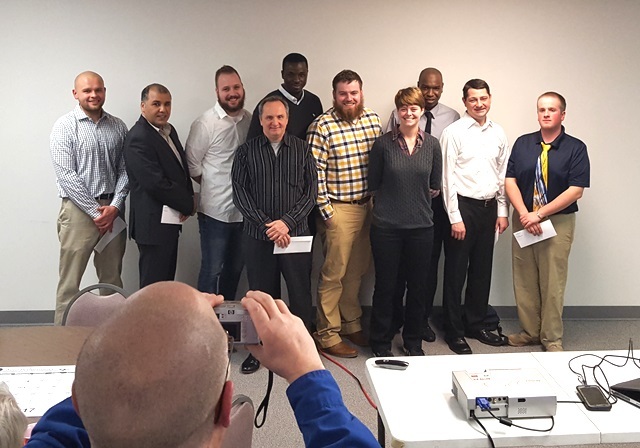 This year's recipients (L-R) Alexander Krigbaum, Mhamed Igoul, Cohen Fetters, Marvin Neubig Jr, Alioune Diaw, Cole Bryant, Saryn Mayfield, Ali Abaker, Ryan Goddard and Aaron Lehuta. Recipients not in attendance are: Michael Andrews, David Hallmon, Thomas Lahman and Nicholas Liberati. 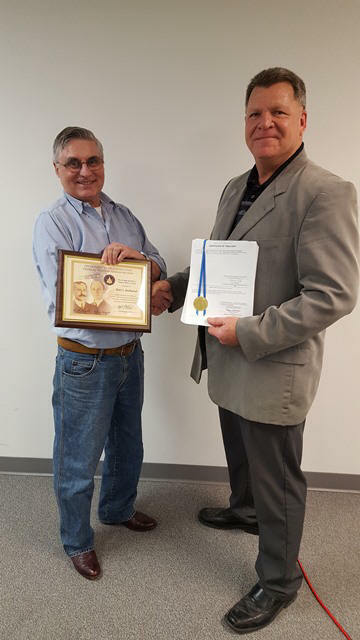 Next FAA FAASTeam Program Manager, Inspector Mark Harden presented the Master Pilot's Award to Earl Redmond acknowledging his 50 years as an active pilot. Earl gave a brief history of his flying career which included travel with his wife Carol who was in attendance for the award. 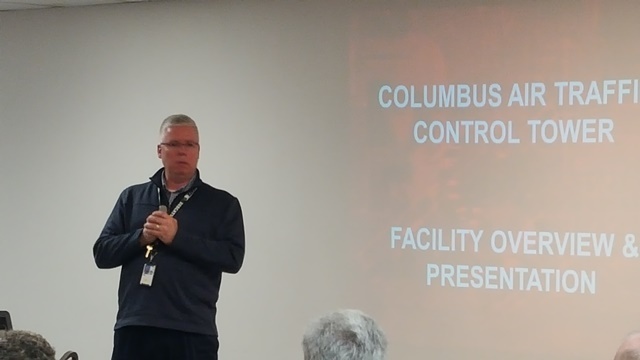 Columbus Air Traffic Controller Dave Neff presented an overview of the airspace that the Columbus Tra-Con controls from East around Zanesville, North to just around Mansfield, West into Indiana and South to the start of Cincinnati Airspace. He gave an overview of the training that controllers go through and emphasized the attrition rate as candidates are weeded out over the many years of different levels of training. 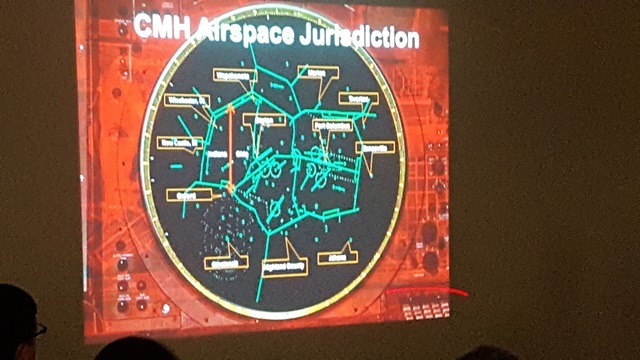 His presentation showed the many arrival and departure gates that separate traffic at the larger airports and called the skill a controller develops as "Fluid Geometry". He spoke of upcoming ADS-B and the new traffic control environment but told us that the surveillance radar would still be in use for years to come. He told us of an event where a VFR pilots was caught on top of a cloud base that went nearly to the ground and the coordination of three controllers to get him to an airport with the best visibility and talk him down to the ground before he ran out of fuel. He finished the story asking pilots to call the tower if they're ever asked to, not to be busted by ATC but to discuss what had happened to help prevent a reoccurrence. We want to thank Controller Neff and Inspector Harden for the evenings presentation and hope all who attended received some benefit from this informative topic and the question and answer period at the end. 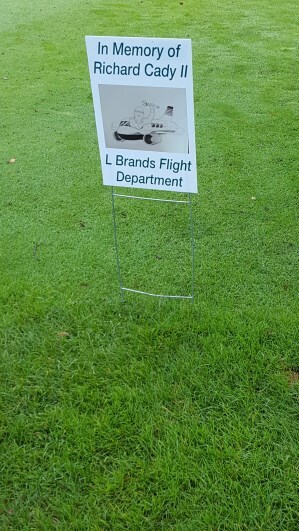 We'd also like to extend a big Thank You to Lane Aviation for the use of their facility. This year's Maintenance Symposium had 321 in attendance, with 21 vendor booths and 15 speakers. 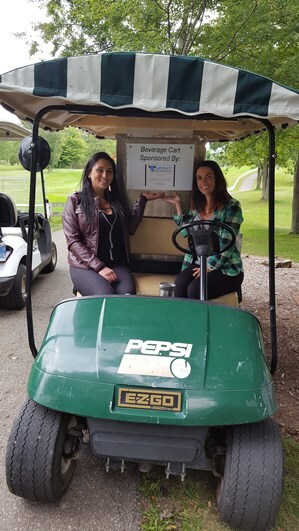 Proceeds from the COPAMA Raffle raised $625.00 for the COPAMA Scholarship Fund and we want to thank those vendors who provided the prize items for the raffle. 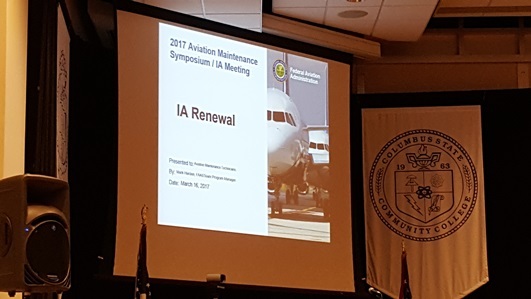 We also want to thank those who gave the presentations, Mark Harden and the other FAA Inspectors and representatives, the staff of Columbus State and the volunteers who helped with the Symposium. Please check the Columbus State Aviation Symposium website for other details and thank you to all who attended! 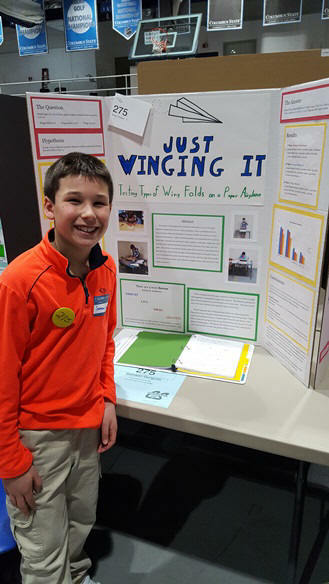 On Saturday, March 18th, Earl Redmond, Gene Sprang and Lowell Dowler of COPAMA attended and judged 5 aerospace related entries for this year's GE/COPAMA Science Day Awards. Our 2017 winners received a crystal diamond shaped award from G.E., a certificate and a monetary award from the COPAMA Scholarship Fund. 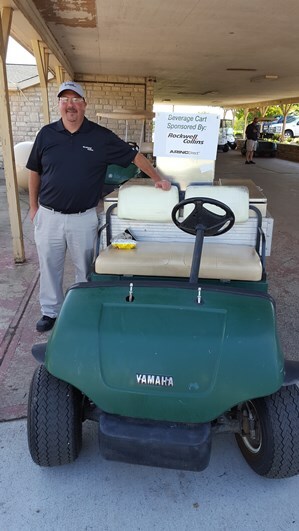 Jim Kulp of General Electric was unable to attend this year's event but we wish to thank him and G.E. 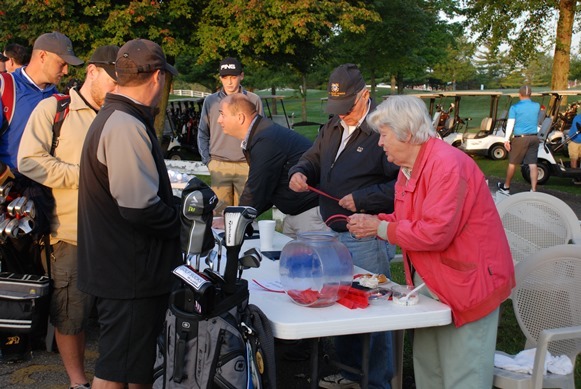 for their continued support of this annual event. 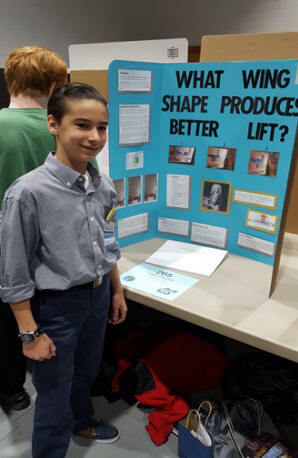 "What Shaped Wing Produces the Best Lift?" 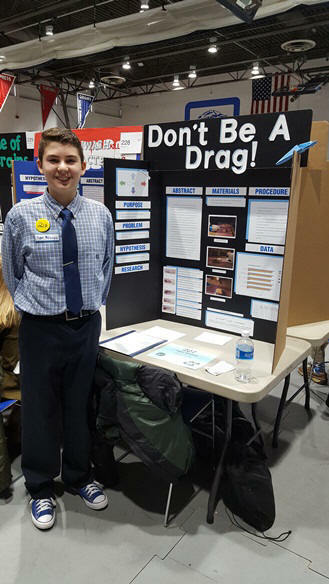 "The Effect of Drag on the Distance a Model Plane Flies!" We want encourage our awardees to continue their study of science and aviation and thank our judges for their participation in this years Science Day! Our April meeting featured a presentation by Dr Mike Stretanski AME on the upcoming changes on May 1st to alternate 3rd Class Medical Certification called Basic Med. 27 people attended the meeting which included portions of two Power Points to show what details are available on the upcoming rule change. 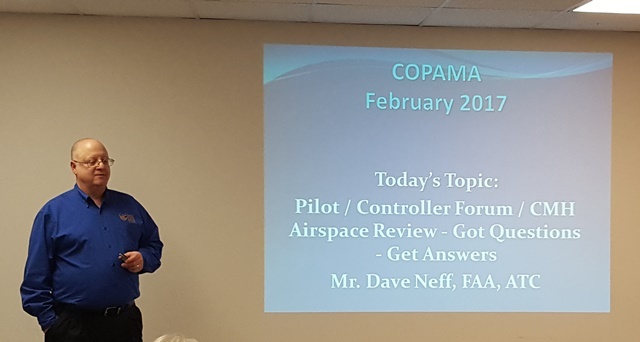 Dr. Stretanski noted that with 20 days remaining from the night of our meeting to the May 1st date, the training and other details for obtaining a BasicMed Certificate are still not available on the FAA's BasicMed website. He then presented known changes in the forensic examination the doctor will perform in comparison with the current 3rd Class Medical Certificate. There also are limitation related to past health issues and medical certification that determine if a BasicMed Certificate may be obtained. He also expanded on prescribed drugs and drug abuse that will cause special handling or outright denial of even a BasicMed certificate for flight operation of an aircraft. We want to thank him for spending the evening with us after a long day of personal medical attention. There was a short organizational meeting after the event to discuss the future of COPAMA. 9 people including 1 Member, 6 Board Members and 2 Visitors stayed to help plot our future course. Those plans will be finalized and announced at next month's meeting. 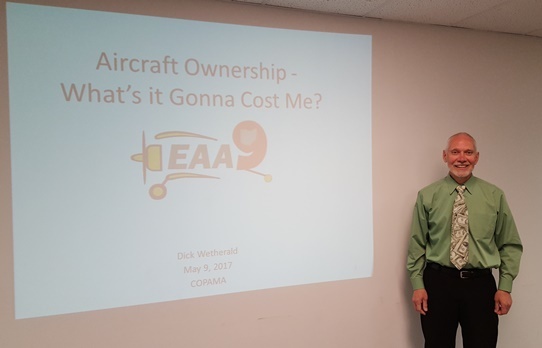 May 9th Topic: "Aircraft Ownership Costs"
Our May meeting featured a presentation by Dr. Richard Wetherald on "Aircraft Ownership Costs". It was held at Lane Aviation's Media Room, 4387 International Gateway on the second floor with the social gathering at 5:30 with a light dinner at 6:00 and Dr. Wetherald's presentation immediately following. 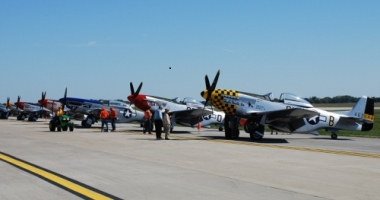 Those in attendance were able to sign up for FAASTeam Wings and AMT credit. The presentation brought up several topics that should be considered before making that leap to aircraft ownership. How often you fly, type of flying, your certifications and your proximity to local airports are all of concern in deciding to purchase or continue to rent aircraft. His full presentation is available for download from the www.EAA9.org website and is well worth the time to review. It also includes examples of expenses he's incurred during the 30 year ownership of a Cessna 172. We wish to thank Richard for his informational topic and thank Lane Aviation and staff for the use of their facility. This is our last monthly meeting of the year so we wish everyone a fun and productive summer 2017! 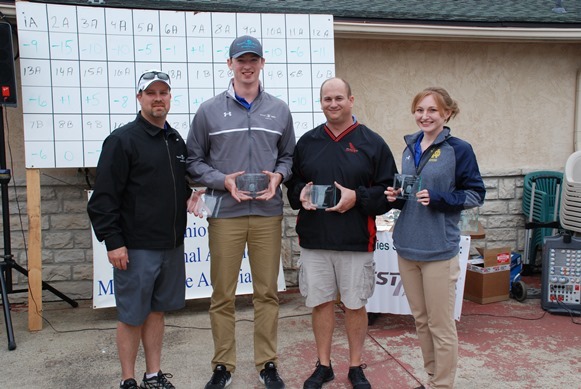 COAGO 2017: Another great outing in the books! 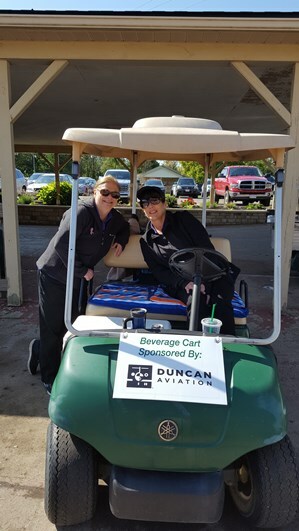 The weather was nearly perfect for this year's Central Ohio Aviation Golf Outing held at the Kyber Run Golf Course on Friday, September 8th. The final update is in work for winning teams, players and stats. Please check back! 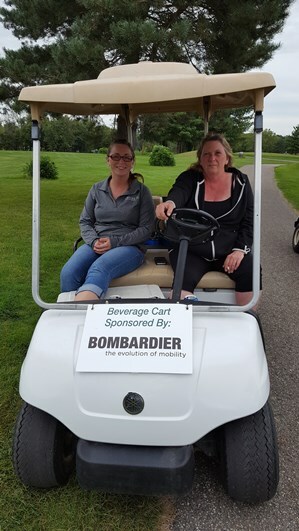 Many Thanks to this year's Sponsors, Kyber Run Golf Course, our Volunteers and all who attended COAGO 2017! 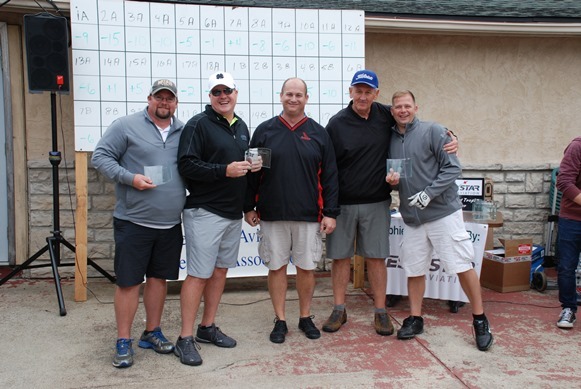 * Four Teams tied at 10 under and the winner was determined by their scores from the most difficult handicap holes. On the fourth hardest hole, Constant Aviation was determined to be the winner but left before the awards were presented and photos taken. Correspondence and questions about the event may be sent to golf2017@copama.org ! This page was last updated on 02/07/18.